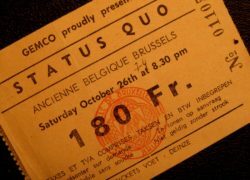 Item description: Status Quo ticket from their 26th October 1974 concert at the Ancienne Belgique, in Brussels, Belgium. Orange stiff paper ticket overprinted in red and black. Ticket number 01105. Condition report:Excellent overall condition. One slight crease. Background to Status Quo: Status Quo formed in 1962 under the name The Scorpions with Francis Rossis, Alan Lancaster, Alan Key (drums) and Jess Jaworski (keyboards). Rossi and Lancaster played their first gig at the Samuel Jones Sports Club in Dulwich, London. In 1963, Key was replaced by John Coghlan and the band changed name to The Spectres. They began writing their own material, and after a year met Rick Parfitt who was playing with a cabaret band called The Highlights. By the end of 1965, Rossi and Parfitt, who had become close friends, made a commitment to continue working together. On the 18th July 1966, The Spectres signed a five-year deal with Piccadilly Records, releasing two singles that year, “I (Who Have Nothing)” and “Hurdy Gurdy Man” (written by Alan Lancaster), and one the next year called “(We Ain’t Got) Nothin’ Yet” (a song originally recorded by New York psychedelic band The Blues Magoos). All three singles failed to make an impact on the charts. Parfitt joined the band in 1967. By 1967, the group had discovered psychedelia, and named themselves Traffic, but were soon forced to change it to Traffic Jam to avoid confusion with Steve Winwood’s Traffic, following an argument over who had registered the name first. The band, with newly-joined organist Roy Lynes, secured an appearance on BBC Radio’s Saturday Club, but their next single, “Almost But Not Quite There”, underperformed. In late 1967, the group were now officially calling themselves Status Quo, and in January 1968 released the timeless, and psychedelic-flavoured “Pictures of Matchstick Men”. Rick Parfitt was invited to join the band just as the song hit the UK Singles Chart, reaching number seven; “Matchstick Men” additionally became the group’s only Top 40 hit in the United States, peaking at number twelve on the Billboard Hot 100. Though the follow-up was the unsuccessful single, “Black Veils of Melancholy”, they had a hit again the same year with a poppy song penned by Marty Wilde, “Ice in the Sun”, which climbed to number eight. After the breakthrough, the band management hired Bob Young as a roadie and tour manager. Over the years Young became one of the most important songwriting partners for Status Quo, in addition to playing harmonica with them on stage and on record. After their second album Spare Parts failed to impact commercially, the band abandoned psychedelia and Carnaby Street fashions in favour of a hard rock/boogie sound, fronted with faded denims and T-shirts, an image which was to become their trademark throughout the 1970s. Lynes left the band in 1970, and was replaced in the studio by guests including keyboard player Jimmy Horowitz and Tom Parker. By 1976, ex-The Herd, Judas Jump and Peter Frampton band member, Andy Bown, was brought in to cover keyboards. Status Quo have had over 60 chart hits in the UK, starting with their1967 “Pictures of Matchstick Men”, and the most recent being in 2010. This is more than any other rock group. Twenty-two of these chart hits reached the Top 10 in the UK Singles Chart. In 1991, Status Quo received a Brit Award for Outstanding Contribution to Music. Special notes: This concert is the first time Status Quo played in Belgium. The Ancienne Belgique is located in the historic heart of Brussels, and is the leading concert venue in Belgium for local and international concerts. Provenance: This is the actual ticket shown on the Lee Hawkins ‘Status Quo History’ website.